Zeke moved to OwyheeStar from Northern California where he had been active for a short period of time. 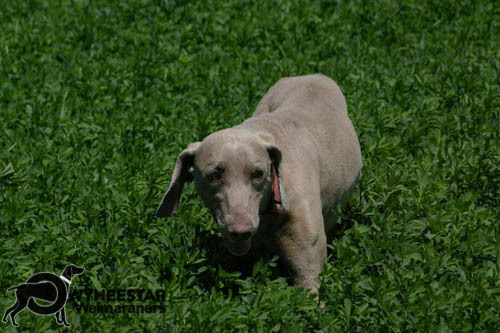 His breeder (Stillwater Weimaraners) needed to get out of breeding. They offered us three Weims--Zeke, Penny, and Megan. We loved all three; the move was a difficult one for them. It taught us much about relocating the older Weim. Zeke was our second Stud Dog--we had only Dash before him. He has a lovely temperament--friendly and sweet to a fault.